The Missa Salisburgensis has long evoked awe and wonder at its scale and magnificence, being scored for no less than 53 vocal and orchestral parts and (with the inclusion of the motet "Plaudite Tympani") lasting nearly three quarters of an hour - even at modern tempi. It is almost certainly the largest scale Mass setting of the early Baroque. For many years its provenance was uncertain; it had been attributed to the Italian composer Orazio Benevoli as a commision for the consecration of Salzburg Cathedral in 1628. It is now known to be by Heinrich Ignaz Franz Biber and was first performed in Salzburg Cathedral in October 1682 in celebration of the eleventh centenary of the foundation of the Archbishopric of Salzburg by Saint Rupert. Biber was born in Wartenburg, Bohemia, in 1644 and became a most widely acclaimed composer in Bavaria, Austria, Bohemia and Moravia, especially in the well nigh incredible virtuosity of his violin playing and his talent for improvisation. He settled in Salzburg at the age of 26 where he followed the career of a celebrity and held the post of Kapellmeister to the Archbishop. The present recording was also made in the Cathedral during the Salzburg Festival in 1998 and the synergistic match of the music to the resonant gradeur of the Cathedral's baroque architecture can be powerfully felt. This music is High Baroque at its most pompous and bombastic; it was designed to impress upon the congregation the might and majesty of "Ecclesia Triumphans". The "Kyrie" opens straight away with powerful flourishes on the trumpets and clarini with rippling polyphonic choral writing - and this sets the tone for the whole work. "Christe eleison" is quieter (but no less vivace) with delicate writing for the strings and woodwind. The "Gloria" has, if anything, even more monumental impact, with finely judged sections alternately "fortissimo con tutta forza" and quiter reflection. However, the ultimate splendour is reserved for the "Credo" which lasts fully 13 minutes. On this recording, the centrality of the affirmation of faith is flanked by two of Biber's sonatas for brass consort and tympani with organ continuo. (This performance practice follows a convention previously exemplified by the 1977 Archiv recording by Musica Antiqua of Cologne with the Gabrieli Consort.) This dramatic structure makes the repose of the central "Et Incarnatus" and "Crucifixus" all the more poignant. 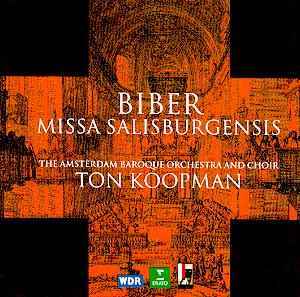 Just as Biber's music was a magnificent festal celebration in 17th Salzburg, so this recording is an equally fitting celebration of the 20th anniversary of the founding of the Amsterdam Baroque Orchestra. Since 1979 Ton Koopman has become established as the World's leading interpreter and conductor of Baroque music (especially of J.S. Bach). This recording displays the authenticity and technical brilliance of period instrument playing in the orchestra and of singing by this professional choir to exhilarating effect.